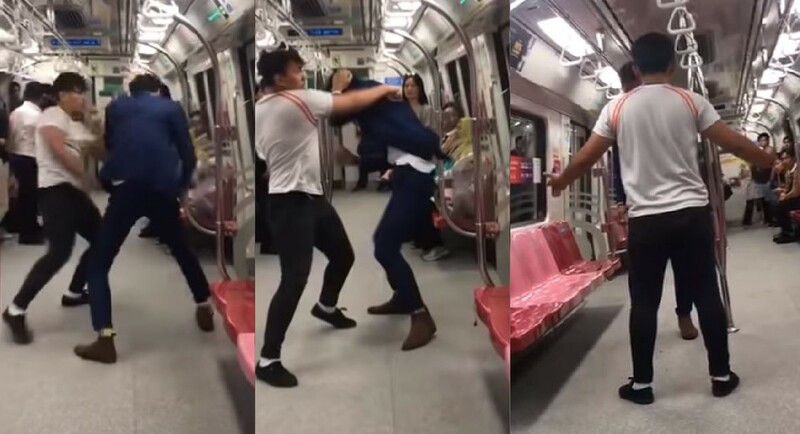 Two men who fought on board an MRT train have reportedly been arrested after a video capturing a rather violent fight between the men went viral on social media, this evening. The two men, reportedly aged 16 and 25, thrashed one another in a fight that reportedly arose out of a staring match. Some netizens online are speculating that the teenager, clad in white, is an ITE student although such claims remain unverified. In the video, that is circulating on Facebook, YouTube and forum sites like Reddit and Hardware Zone, two men can be seen embroiled in a physical fight on board an MRT compartment. Concerned commuters hurry to clear the compartment where the men throw punches at one another, while commuters occupying the section of the compartment behind the men also try to move away from the scene.